Orion, "The Hunter," is perhaps the most prominent constellation in the sky, visible from nearly any latitude on Earth and containing the zero-magnitude blue supergiant star Rigel, first-magnitude orange-red supergiant star Betelgeuse, and five second-magnitude stars, three of which form the distinctive "belt" at the heart of the constellation. North is at the top of this image. Arguably the most famous and most beautiful deep-sky object in the heavens, M42, the Orion Nebula, forms the central "star" in Orion's "sword" located below the belt. To the east of Alnitak, the easternmost of the belt stars, is NGC 2024, the Flame Nebula, with IC 434 and B33, the Horsehead Nebula, to the south. At bottom right, to the right of Rigel is IC 2118. Barnard's Loop, Sh2-276, is the large "C"-shaped emission nebula around the belt and sword. 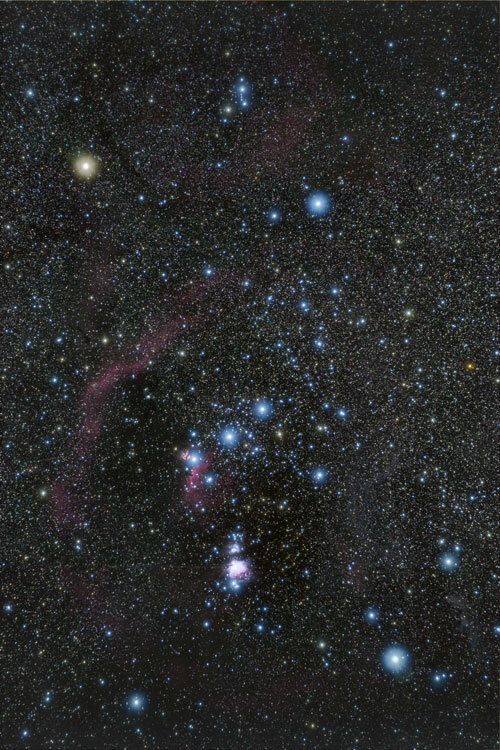 The other large emission nebula, Sh2-264, encircles Orion's head, Meissa (Lambda Orionis). Technical Notes: A diffusion filter was used for three exposures for the RGB channels to enhance the bright stars. The RGB images were created in Registrar 1.0. The diffused RGB image was blended the the LRGB image using the Lighten function in Photoshop CS3. Gradients were removed using Russell Croman's GradientXTerminator plug-in for Photoshop.